The real wood grain is absolutely mesmerizing. You won’t be able to help but admire the craftsmanship, the rich tones of the hand joined cedar strips and the clear finish that really highlights the artfulness of this piece. 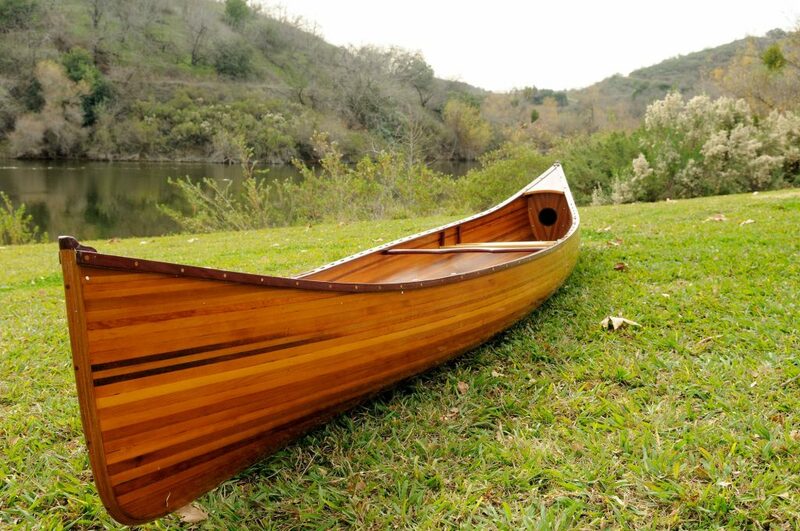 This 16’ canoe will take you on journeys like never before. Designed for pleasure and beauty, it is built to last a lifetime. Throwing it back to another time, an era of tradition and craftsmanship, this canoe is as much showpiece as it is ultimate water vessel. Beautiful to look at, you will love exploring the local waterways as you enjoy the richness of the wood, the detail and character offered by the ribs and the way in which the watercraft smoothly glides along. This canoe will become a weekend tradition with your family. Fish, paddle, race, jump off and swim. Whatever the activity, this boat will accommodate and look amazing doing so. A true classic, this canoe with ribs will allow you to float back in time and relive what it was like for those fromcenturies ago to experience the water. Handmade and crafted with top grade western cedar, each strip is hand joined and then coated in a fiberglass epoxy resin. 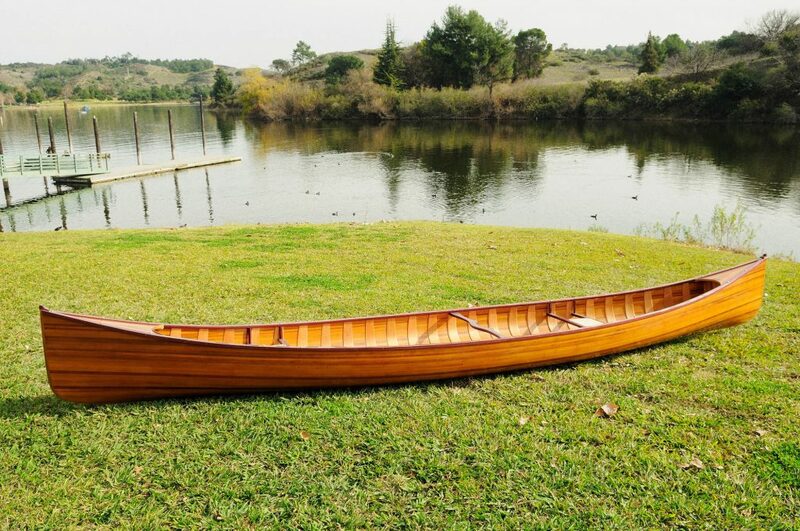 Made for a day lazy day on the lake, a jaunty ride along the river or just sightseeing while breathing in the trees, water and fresh air, this canoe is one we’re extremely proud of. 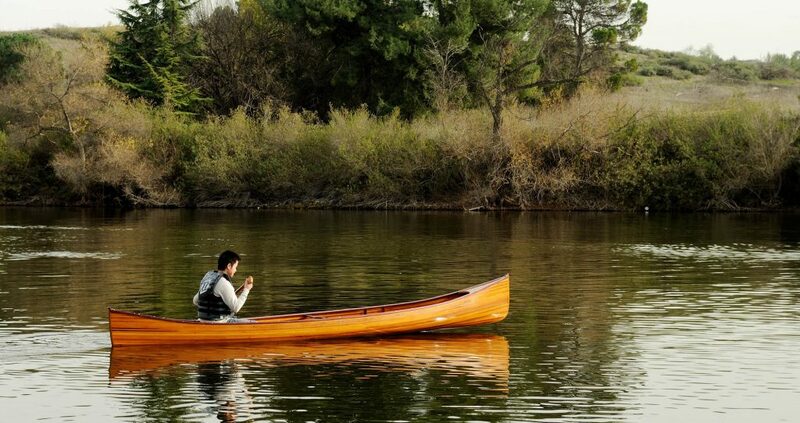 Enjoy the day, get lost in your weekend as you canoe out on the lake or stream with this amazing vessel. Beauty and function combine to make this an incredible canoeing experience for the beginner or expert alike. Requiring over 400 hours build time, this demonstrates years of boat making ability and prideful tradition. Each cedar strip is hand selected and hand joined and then encapsulated in fiberglass epoxy to give you the ultimate boating experience. Here is a canoeing experience you will not soon forget. 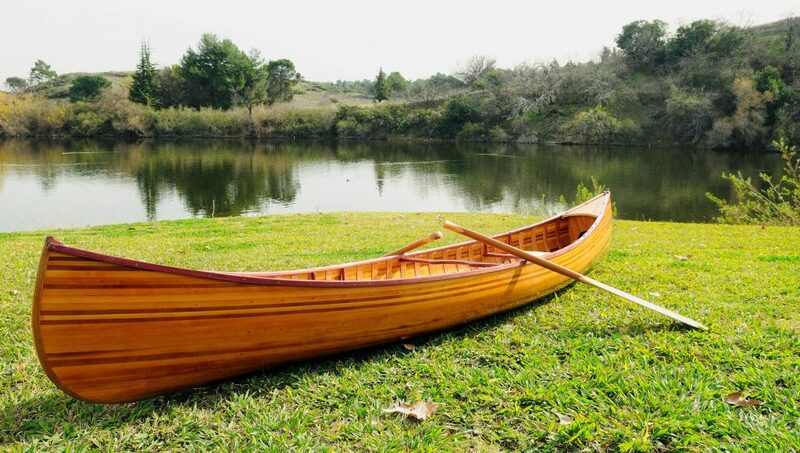 The ultimate in boat making craftsmanship and stunning beauty combine to give you this 12 foot matte finish canoe that will take your day on the water to a whole new level. Investing hundreds of hours in its creation, we bring you a superior product not easily mimicked in today’s market. This is because we believe in old word values and centuries-long traditions when it comes to boat building. The dark stain is just the touch needed to take this particular piece to a whole new dimension. Imagine gliding along the water in this handcrafted vessel as you admire the beauty inherent to the wood and the richness afforded by the stain. A masterpiece indeed, this canoe contains the thought, care and craftsmanship that comes with 500 man hours. You are not simply riding along in a canoe, you are cascading across the plane of the water in a legacy of boat building and woodworking. A handcrafted classic is all we can say about this amazing watercraft. Hundreds of man hours later, we have created a boat that is made for enjoying a day on the water while harkening back to a time of old. Tradition is alive and well in this canoe and you will certainly be aware of that while paddling along. Using only the best quality red cedar and finishing the boat with a durable fiberglass epoxy, we ensure that this product will last for many many years to come.